This was a “snow-day” in St. John’s … 30cm of the fluffy white stuff fell last night and this morning, closing schools and making for prime winter scenery all around the city. Snow days are a big deal in our house, since my wife Susan works in the school system. And this one wasn’t going to be wasted – not long after breakfast, I was put to work helping clean the kitchen. 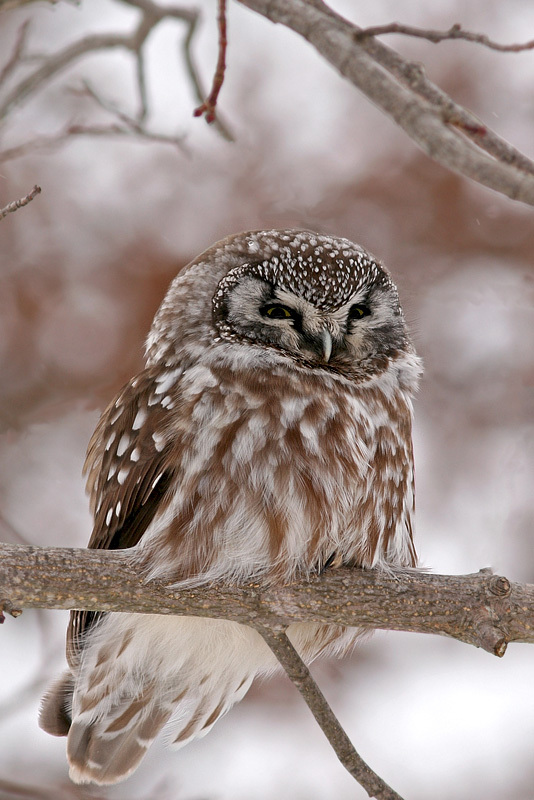 One more reason to be happy when the phone rang with news of a Boreal Owl sitting in a private yard in the west end of town … an excuse to “sneak out”. 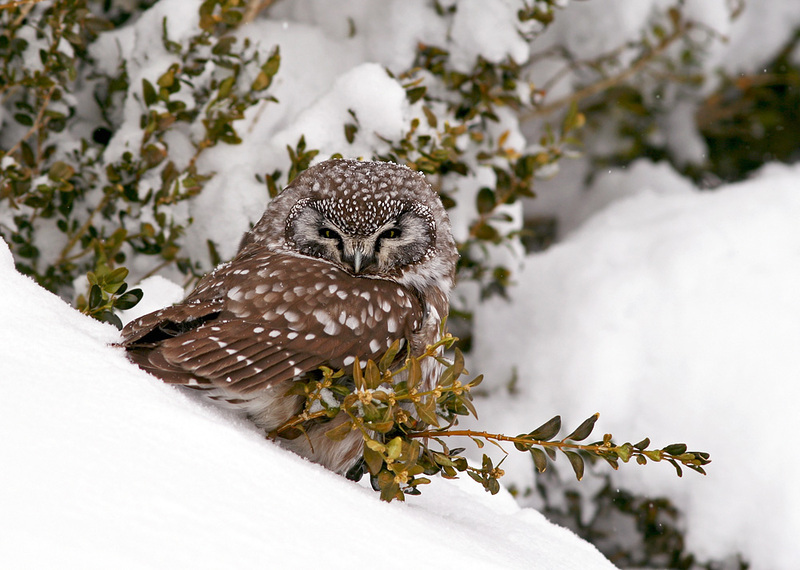 Boreal Owls are definitely one of my favourite birds. They are known for visiting residential neighbourhoods in mid-winter, when deep snow has impacted their traditional hunting areas in “the bush”. 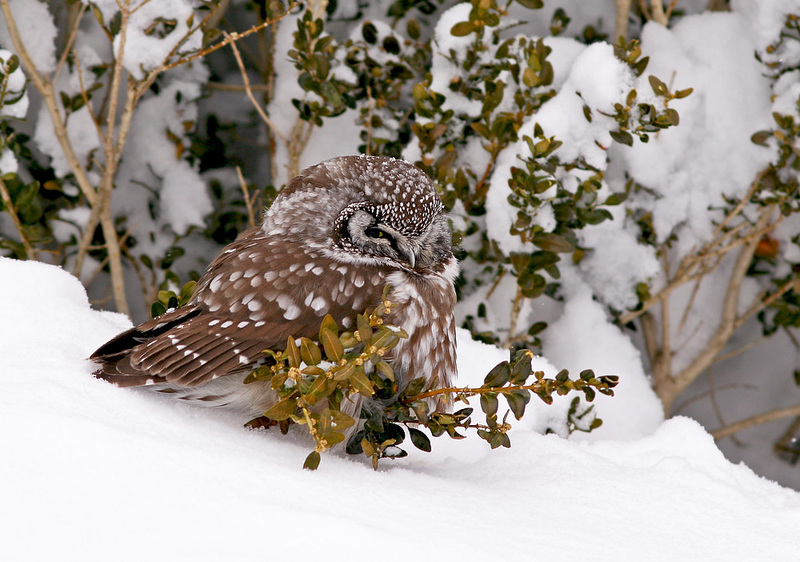 After finishing my chores and putting in an hour of shoveling, I headed across town in hopes that the little owl (one of my favourite birds!) was still there. Sure enough, it had moved to the next yard and was sitting in the snow at the base of a holly bush – completely unperturbed by the next door neighbour out snow-blowing his driveway! I set my camera up a comfortable distance away and waited … it was sleeping for the first ten minutes, its head tucked in and turned away. Eventually it woke up and turned to look at me, eyes open just a slant, before settling back in for another nap. A short while later, it shook itself awake, turned around and began staring intently at the little flock of chickadees and juncos at the feeder across the fence. Several minutes and at least two false starts later, it catapulted off the ground and made a run for them. Coming up empty, it landed on a bare branch about ten feet off the ground, right above the road. What a beauty!! Two minutes later it took off again, diving over a hedge across the road in pursuit of what must have been a very startled chickadee. Other chickadees chased it, scolding all the way. I have no idea if it grabbed lunch or not, and lost it as it flew around the side of the house. This little fella posed on a bare branch for just a couple minutes after a failed “smash-n-grab” attempt on some black-capped chickadees. It was fun to see it actively hunting – something I only witnessed once before, in Finland. 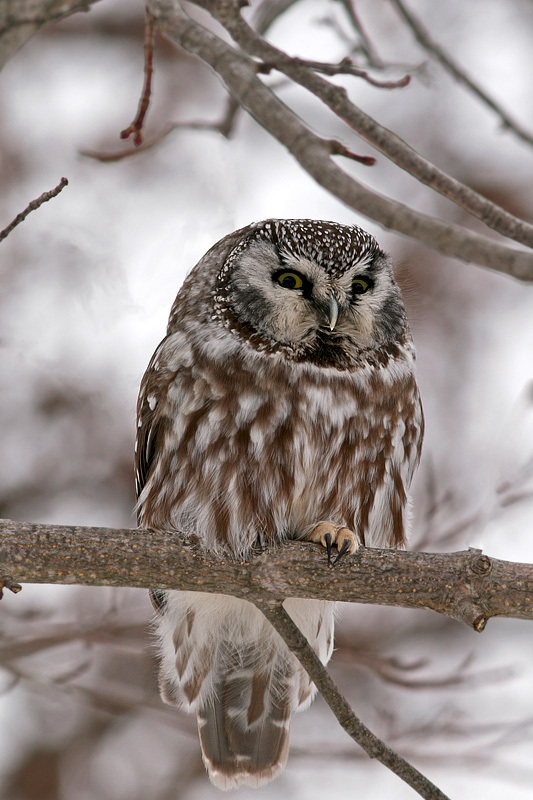 This entry was posted in Uncategorized and tagged Aegolius funereus, Boreal Owl, Newfoundland, St. John's, winter bird list. Bookmark the permalink. ← Island-hopping: From Newfoundland to Hawaii! Wow…amazing story and pictures!! I have seen great horned owls at our cabin in central but never had opportunity to get a picture. I have never seen any others. The boreal is so,pretty. You obviously have great photography skills! Splendid, splendid photos. In fact the whole website is gorgeous. I have seen a lot of Snowy Owls this year but no others although I know they must be lurking around somewhere! I look forward to seeing more of your wonderful photos and reading about where you find these creatures. Outstanding images, and what a great snow day! This is a species I’m dying to see. Are they normally diurnal like hawk owls, or just “as needed” during the winter months? What a great experience with awesome photos to match!